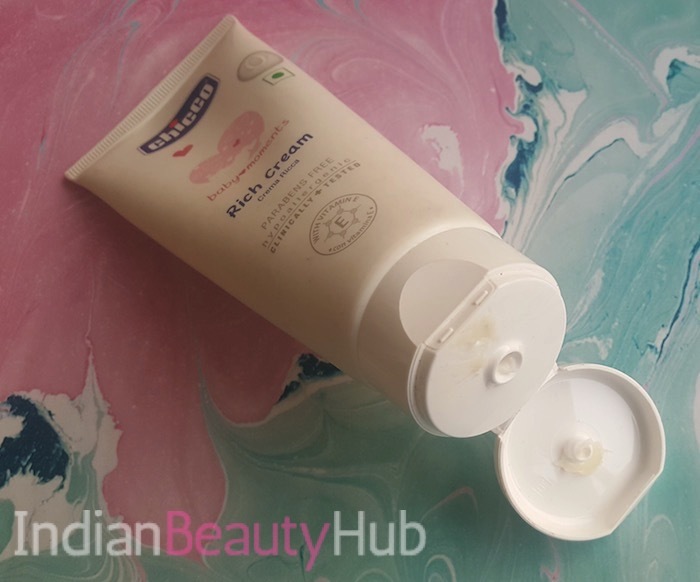 Hey everyone today I am reviewing the Chicco Baby Moments Rich Cream. I’ve been using Chicco skincare products for my baby girl since she was one month old. I did share my baby’s skincare routine and the products I’ve been using for her if interested you can check the list here. The rich cream contains oils rich in Omega-3 and Vitamin E and nourishes baby’s skin deeply, thanks to its highly moisturizing formula and the rich texture. Particularly suitable for dry areas. 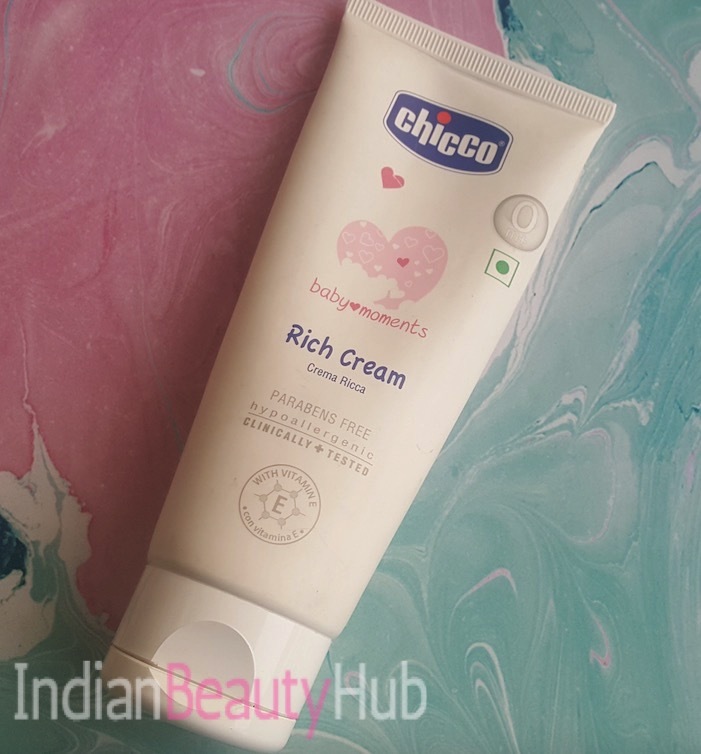 Price & Availability: The price of the Chicco Baby Moments Rich Cream is Rs.399 for 100g. 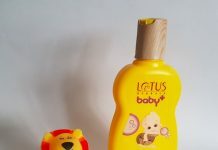 It can be bought from kids retail stores like Firstcry, Mothercare, etc. and also online from Nykaa, Amazon, Flipkart, Firstcry, etc. 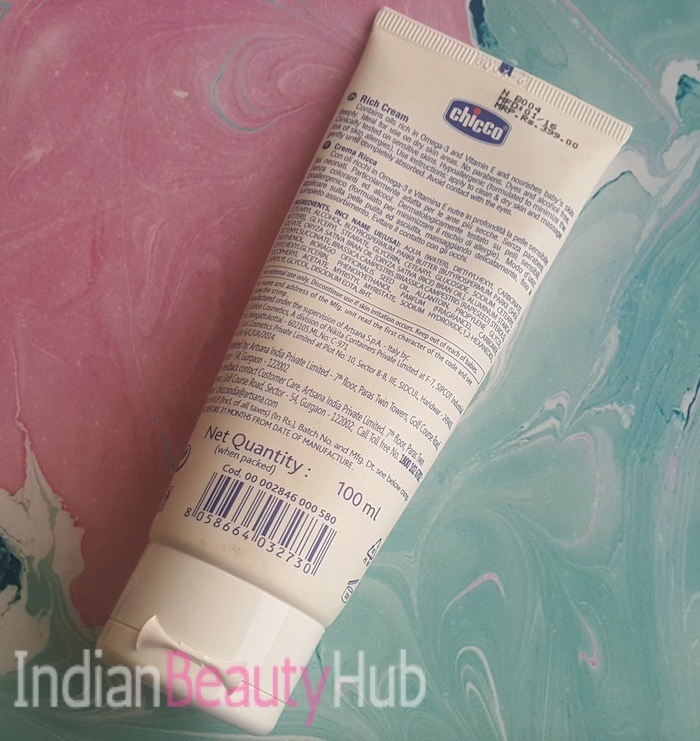 Packaging: Chicco Baby Moments Rich Cream comes in a white squeeze tube with flip cap. 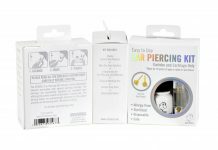 The packaging is sturdy, hygienic to use and travel-friendly. Chicco should make the tube’s edges round so that baby’s do not get hurt due to the current sharp edges. 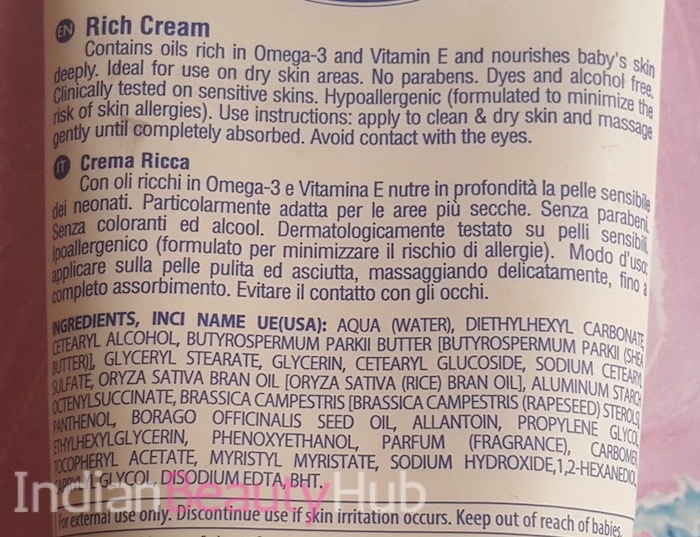 My Experience: I’ve been using this rich cream on my baby for the past 14 months and I really liked it. The cream comes in a white color and has a slightly thick consistency. It spreads easily and gets completely absorbed into the skin with a little massage. It moisturizes the skin nicely without feeling greasy or sticky. I use this cream on my baby girl’s face, elbows, knees and other dry patches. It reduces dryness and keeps baby’s skin soft and moisturized for a long time. 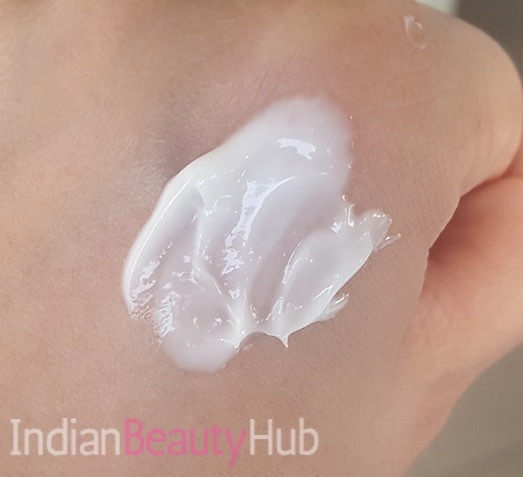 Even I used this rich cream many times and really liked its after results. It is one of the must-have baby care essentials, especially during the colder months. It is enriched with Omega-3 and Vitamin E that act as a barrier against excessive heat and cold and stabilizes the temperature of the baby’s body. Its hypoallergenic component ensures the minimizing of skin allergies. It is free of parabens, dyes, and alcohol. It comes with a mild fragrance that will not irritate sensitive baby skin. 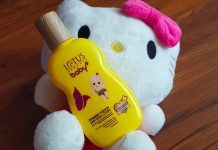 It moisturizes the delicate baby skin without causing any allergy. It can be used on newborns. Some people can find it expensive. 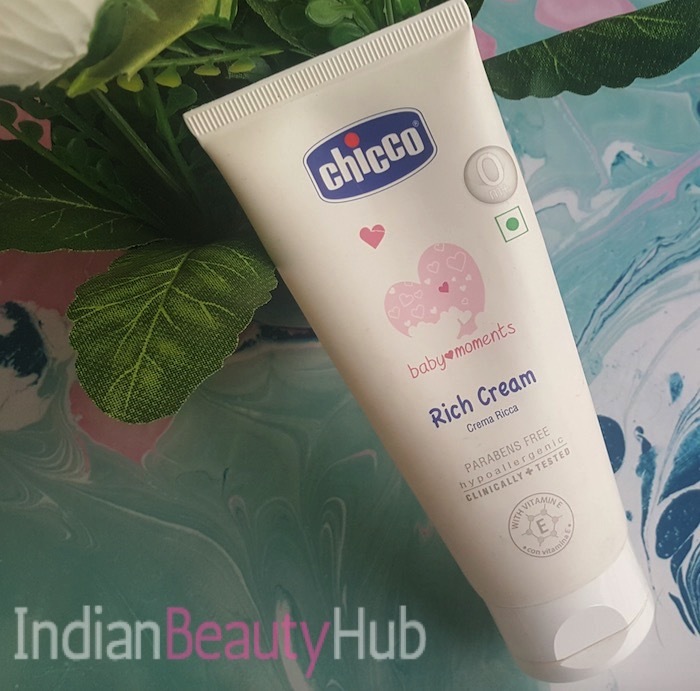 Overall, I absolutely loved the Chicco Baby Moments Rich cream. It is one of the best moisturizing baby cream that treats dry skin effectively and leaves baby skin soft and nourished for long. Highly recommended!